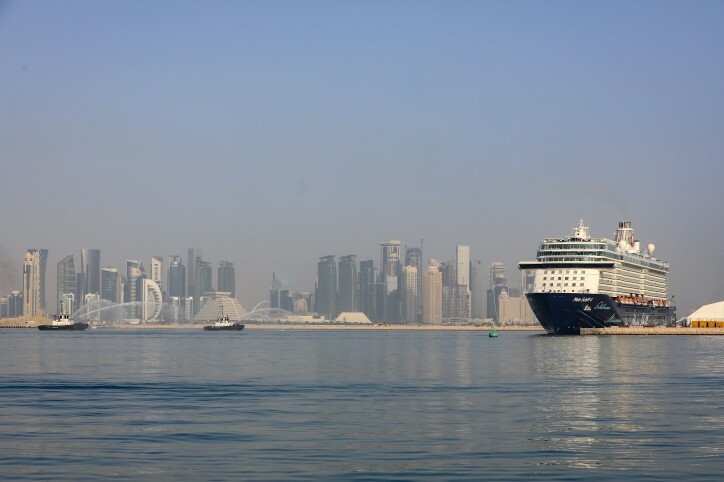 TUI cruise ship Mein Schiff 4 (see also CruiseMapper) docked at Doha Port - Qatar’s Gateway to Marine Tourism on Thursday, November 8, 2018, marking its maiden call to Qatar and carrying more than 2,522 passengers and 1006 crew. Mein Schiff 4’s visit is the first of 10 calls scheduled for the 2018/2019 cruise season, which runs until May 2019. Mwani Qatar in coordination with the concerned authorities provided all necessary facilities to passengers who arrived on board the ship, ensuring them easy and safe entry and exit to and from the port, so that they can start their tours in record time and within a short period of the ship's anchoring on the quayside. A special ceremony to mark the maiden call was attended by a number of officials and dignitaries. Commemorative shields were exchanged on the sidelines of the ceremony. Mwani Qatar’s CEO Capt. Abdulla Al-Khanji said: "The success of receiving one of the world's largest cruise ships in Doha port today reflects the confidence that the port has gained among the world's cruise ship operators and reflects its ability to promote this growing industry in Qatar in line with the Ministry of Transport and Communications’ strategic plan aimed at developing maritime transport in the state. Receiving such vessels, providing them with best services and all necessary facilities will attract and encourage more cruise ships and cruise lines to visit Qatar, Al-Khanji added. He pointed out that ten new cruise ships will make their maiden trips to Qatar this season. “Mwani Qatar works closely with its strategic partners such as National Tourism Council, the Ministry of Interior and the General Authority of Customs to ensure first class services for cruise ships visiting the port and providing them with the necessary facilities for checking passports and customs clearance to assure smooth disembarking and departure at the appropriate time”, the CEO of Mwani Qatar said. Doha Port is now in redevelopment mode and will certainly be a future hub port for cruise ships and luxury yachts of all sizes. Once completed, the port will be ready to host multiple mega ships at the same time, Al-Khanji added. He further noted that the port's transformation into a major cruise port in the region will bring significant economic returns to companies, hotels, restaurants, retail, services and tourist attractions in Qatar. With a length of 293 meters, 35 meters in width and 8.27 meter drought Mein Schiff 4 is one of the world’s newest cruise ships. It was built in 2014 and began its first trip in June 2015. The ship consists of 15 decks. Passengers on board can enjoy a variety of dining options and restaurants, a 3-level theatre, a basketball court, a kids club, and a pool deck containing one of the longest pools on a cruise ship.